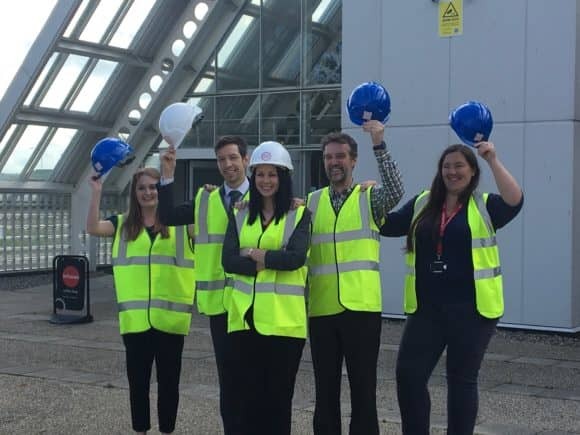 Dundee Science Centre is celebrating the culmination of a £2M fundraising campaign, with works officially underway on its major re-development. Contractors are now on site to embark on the major, seven month transformation which will see construction, within the footprint of the building, doubling the upper floor space. The development has been designed by Aim Design, Dundee and, following a rigorous tendering process, Dundee Science Centre appointed Elmwood Projects as Main Works Contractor and Huettinger as Exhibitions Contractor. Ryden is carrying out the role of project management for the works. Kickstarted by an initial contribution of £850,000 from The Wellcome Trust, the redevelopment has also been funded by the Scottish Government to the tune of £248,000, and by Dundee City Council, Scottish Enterprise and Robertson Trust. The highlight of the development is the ‘Medical Marvels’ exhibition which will deliver an interactive visitor experience featuring state-of-the-art technologies and medical advancements within areas such as keyhole surgery, anatomy and medical imaging. Recognising the past, present and future of science, visitors will approach the exhibition through a fascinating heritage walk. They will then discover how we can see inside the body through Magnetic Resonance Imaging (MRI) and explore how disease can be diagnosed and treated through minimally- invasive techniques, world-changing innovations all developed in Dundee itself. Adopting the role of surgeons or clinicians, visitors will be able to carry out ‘surgery’ on interactive torsos. Indeed, the exhibition is underpinned by the work of Dundee’s very own Professor Sir Alfred Cuschieri, a global pioneer of keyhole surgery and co-founder of the Institute for Medical Science and Technology (IMSaT). Complementing the visitor experience, the re-development will also provide a much improved ‘home’ for the Science Learning Institute, housing an adaptable 80-seat space for seminars and exciting live science shows, learning zones for teacher / scientist collaborative working, break-out spaces and a drop-in zone. The new facilities will enhance the venue’s capabilities and capacity for welcoming an increased number of public and school visits and provide a unique setting for community engagement and corporate events. Complemented by a range of new learning programmes, the institute will provide improved learning and development opportunities for the many professionals who engage with learners throughout the community. The development will also accommodate new facilities for the growing Dundee Science Centre team, who work positively with many partners, developing and delivering activities for visitors to the Centre and through an active community engagement programme. Dundee Science Centre will remain open to visitors throughout the works, with the new space and exhibition due to open to the public in Spring 2018. Linda Leuchars (centre) with, from left, exhibitions and community engagement manager Rebecca Erskine, Councillor John Alexander, communications manager Richard Gourlay and project manager Lucy Wakefield. Linda Leuchars, Chief Executive Officer commented, “This is an extremely exciting time in Dundee Science Centre’s evolution and we are thrilled to have reached this milestone. It is particularly fitting that we will be celebrating local science which is making a global impact, while bringing a diverse cross-spectrum of people together to enjoy science. As a registered independent charity, we are of course delighted to have achieved our ambitious fundraising targets and would like to thank each and every one of our funders and supporters. The project has also received financial support from Al-Maktoum College, Alexander Moncur Trust, DSC Endowment Trust, Foyle Foundation, The Leng Charitable Trust, Martin Connell Charitable Trust, Matthew Trust, Northwood Trust, Sonopill, Thriplow Charitable Trust, Walter Craig Charitable Trust, William S Philips Fund and Mary Ballantyne. For more information on Dundee Science Centre, please visit www.dundeesciencecentre.org.uk.